Starting off with the first post for 2017 we take a look back to a big (ongoing) project from 2016 by kicking off with a game set in Darkest Africa…or in this case, Driest Africa. We shall use Rifles and Spears, my variant for the colonial period, using the Muskets and Tomahawks game system. The setting for this clash will introduce a few new elements onto the table. We’ll be debuting new troops which one of my regular opponents has put together using his very nicely painted Khedival Egyptian army of the 1870s. Opposing his forces will be my Ethiopian, or Abyssinian, forces which works out nicely as these two armies were adversaries during the 1870s. This then sets the scene for our confrontation in this post. The other new addition we’ll be trialing will be a recent arrival from Tiny Wargames, namely their Zulu War mat. Hopefully you’ll be able to get a feel for just what the quality of these mats are like, what they look like on table, and if they work in a setting that we have chosen. Initial impressions are positive. The early 1870s saw the Khedive of Egypt, Ismail Pasha, looking to expand hegemony over his adjacent territories. Egypt, like many European powers, had imperial ambitions of its own. Despite a booming economy built on the back of cotton sales to America due to the five-fold increase in price from the American Civil War, Egypt still found itself in some financial difficulties with a bloated public debt. The Western schooled prince, Ismail, counted himself a progressive looking to bring order to his region of Africa. In this effort he sort to swallow up neighboring Sudan and Ethiopia. This task, ostensibly to ‘protect’ his servile peasant population from the ravages of marauding Ethiopian warbands, was styled a punitive action. In fact, moves were afoot to occupy and administer captured Ethiopian territory after victory had been attained. Tasked with this mission was a Danish officer, Colonel Adolph Arrendrup, at the head of a considerable force. Arendrup’s command, provided him by Cairo, included two chasseur battalions ie sixteen companies of Egypt’s best light infantry. He was also given six companies of Sudanese regulars from Keren, twelve mountain howitzers, six rocket tubes, and artillerymen for crews. Significant in its absence was a mounted complement – the ‘eyes and ears’ of a nineteenth-century army. Arrendrup was later able to recruit 100 Beni Amir cavalry, plus a dozen Bashi Bazouks , and gave the lot over to von Zichy, with orders to create a scout force. In total, maybe 3,500 men, this considerable force set off with high hopes of success in the so called Gundet campaign of 1875. Opposing this expeditionary force were the regional forces from Ethiopia, under the overall control of the Christian King Yohannis (John) of Ethiopia. He was ruler of the province of Tigre when he assisted the British under Robert Napier by providing supplies during the Abyssinian War of 1868. By 1872 he ruled all Abyssinia and was crowned king of kings at the religious center at Aksum (Axum) in Tigre Province, 12 miles west-southwest of Adowa (Aduwa). Unlike the defeats suffered by the then leader Tewodros at the hands of the British with a relatively small army, the Abyssinian army was a much larger force of up to 64,000 soldiers against the Egyptian in 1875. An ally of the British, her majesties emissaries were in service with the Ethiopian army when war broke out in an advisory role. The forces of King John were a potent mix; utilising defensive terrain, sound tactics and military specialists combined with their native war like culture. By the 1870s, most were familiar with the killing zone created by modern firearms. Battlefield strategy stressed encirclement of the enemy via a turning movement from the wings. The centre, with its picked troops, was held back for a telling blow. Feigned retreats were also possible, to allow greater chances to hit the opponents’ flank or rear. Every effort was made to divide men into units of either spearmen or riflemen, so as to get the most out of each weapon type. Tactics stressed rapid contact, skirmishing, advancing under cover, and maximum utilization of their own firepower. The Abyssinian army was not one to underestimate as all comers soon learned to understand in the last decades of the 19th century. The backdrop for our scenario now being set, we see Arrendrup Bey’s Egyptian expedition advancing into north-western Ethiopia toward Massawa, a major port on the Red Sea, in the region now known as Eritrea, to crush the Ethiopian king and all his subjects in one decisive battle. The Egyptian force was fairly typical and straightforward. 4 units of 10 man Egyptian regular infantry, each armed with breechloaders. To this was added two officers, each rated Regular, and a 10-man unit of Sudanese Bazingers. The main man in charge was Pasha Rivertski, a Russian emigre officer. 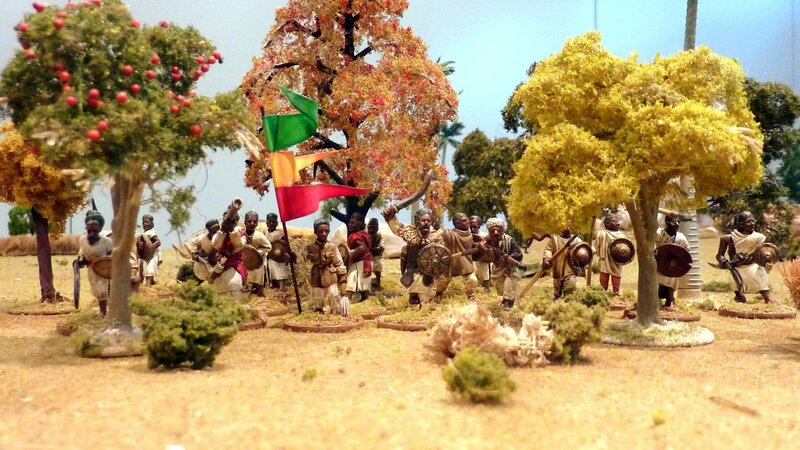 The Ethiopian forces were made up of 6 units. Four units of 10 men each. They were equipped with smoothbore muskets, excepting one which had breechloaders. Two units were armed solely with sword and spear. These forces were led by Ras Ali, the local force commander in the Tigre region. As with all Rifles & Spears games, both players rolled for each side’s objectives. In this case the Egyptian player rolled a Scouting mission and the Ethiopian player rolled a Defence mission. The scouting mission required the Egyptian player to moving in each 2′ square area of the board (six in total), be there at the end of a turn, and thus count it as ‘scouted’. Then he needed to extricate a third of his force to report back to HQ by marching of his base edge. The Ethiopian player needed to defend a position, in this case a water-well, for his main objective to be satisfied. The side-plots for both players were rolled in secret as usual and then the Ethiopian deployed his hidden markers (as his forces have the Scout trait), followed by the Egyptian player who came on from along his base edge on his card draw. With all this done, both sides were ready for action. Both players were dealt their hand of cards, three for the Disciplined Egyptian force and two for the Organised Ethiopian force. Randomly determining the start sequence the first card was played and we’re off! A very nice looking mat – pretty much ‘nails it’ for representing the game area as it would be in real life Eritrea. The rocky kopjes are impassable and the grass counts as Tall Grass area terrain in R&S. There are numerous hills scattered about also. The opening play saw the Egyptian infantry advance in a concentric approach onto the water-well. Drawn to denying the Ethiopian player his objective, this ‘target fixation’ drew in the Egyptians from all directions. The tall poplar tree marks the spot of the water-well. On the left of picture you can see light brown round discs. These are the hidden markers used for the Ethiopians. Three Egyptian units move between the Tall Grass to expedite their movement. 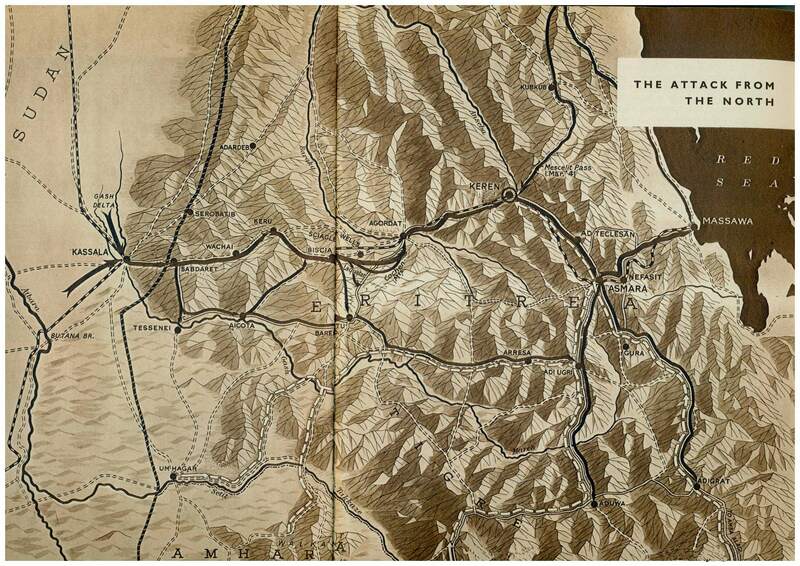 To scout the six areas of the battlefield will require rapid movement. A view behind the Egyptian line. Pasha Rivertski leads the way in his blue uniform. Egyptian troops move forward in line formation – this improves their morale and firepower, but makes them a more vulnerable target. Troops with a Hesitant morale grade rely on being in mass and line formation to bolster their morale. The beginning of the second turn saw the dispositions as below. To the left of picture, three Egyptian units have advanced quickly toward the water-well. To their left the Bazingers have pushed forward making themselves available as a target to the Ethiopians that have now become visible, shown on the right in the tall grass. Winning the initiative the Egyptians press further forward. They are building up an overwhelming firepower force to dominate the water-well area and scout out the area. …when all of a sudden, all hell breaks loose! Lying in the lee of the hill, hugging the ground the Egyptians just crested, are two Ethiopian musket armed units of warriors…standing to their feet, they deliver a devastating volley on their left but execute less effectively on the right. A unit of Egyptian soldiers, taking a whopping five casualties from close range musket fire, fail their morale test and flee back over the ridge (arrow). In support, the breechloading warriors (bottom picture), keep up a continuing fire on the Bazingers to their front. 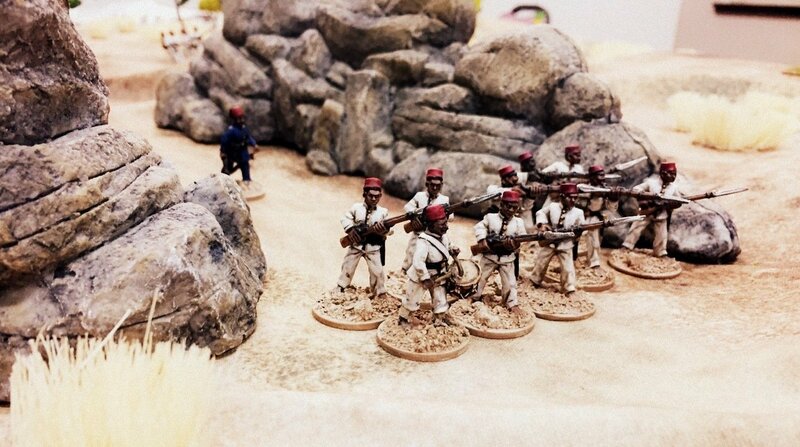 All units test morale but only the lone ‘gutted’ Egyptian unit flees back..a not unreasonable result by any measure. Note that a number of Ethiopian units are yet to be discovered (indicated by the hidden markers). Pasha Rivertski sees his men flee back over the ridge and races up to lend them morale support. …though taking some fire, from the ranks of the Bazingers springs a hero…a natural leader. Waving the way forward, he shall prove useful to his band of warriors no doubt. Turning the thumbscrews on, Pasha Rivertski, card in hand, plays a two-action card and unleashes a continued and effective fusilade. The volleys are deadly and they trigger multiple morale tests, both of which are failed. In a blink of an eye, what was looking so promising, vanishes before Ras Ali’s eyes, he just now making an appearance int he tall grass (right of picture). Unbeknownst to the Egyptian player he now became involved in the ‘madness of Ras Ali!”. (The sideplot the Ethiopian player was given was “Madness!”. This meant each turn players rolled a d6, the highest taking charge of Ras Ali for that activation! Short of fighting his own men, he can be commanded to do anything else!). Things are starting to look up for Pasha Rivertski’s Egyptians. He has seen off to enemy units, forced another to retire and has reinforcements coming up to the secure the position. It would appear that the Egyptians have gained the upper, and possibly, decisive hand. As if things couldn’t get any worse, and Ethiopians unit behind the kopje pops up to make a move toward the end of the rocky escarpment to head of a ‘scouting’ unit of Egyptians. In an instant they are targeted and take three casualties. Testing their morale, they fatally roll a ‘1’ and suffer the ignominious fate of running from the field as quickly as they had been put on! …what else could go wrong? now, with half the Ethiopians routed or destroyed and only one of two off-table reinforcements having arrived, it would appear the Egyptians have things firmly under control. So, at the beginning of the third turn things look fairly good for Pasha Riverstski and his men. Half the Ethiopian forces are eliminated, a slow trickle of enemy spearmen are dribbling on and they have denied the Ethiopians their objective by being within 4″ of the water-well. However, like all things, they are not all as they seem. The main objective for the Egyptian force is to scout out the area and get off the table with their report. To achieve a victory they will have to leave one unit to guard the well (and thus deny it to the Ethiopians) and get off a third of their force ie 13 men. At this time, the third turn, they have not yet scouted any of the three right-side 2′ areas as they have been furiously engaged in firing at the enemy. This turn they must enter and remain until the end of the turn. It looks like the Ethiopians may have delayed the Egyptians long enough for them to run out of time to achieve their main objective…perhaps. …the beginning of the third turn sees the ranks thinned out. (an event card was drawn, and on a roll of snake eyes (two ones) the solar eclipse event was triggered!…we’ve never seen that before! Its effect was to reduce fire effectiveness and move distance and, importantly, to cause all non tribal troops to suffer a -1drm on their morale rolls until the eclipse passed, which occurs on the play of the Event #1 card again…go figure!). Spurred on, the ‘tall grass shooters’ unleash a fusilade into the oncoming Bazingers. Right on cue, they suffer losses, roll a 1 and dutifully rout from the field!…all pray the sun-god…Homer was right! …those long grass shooters have a pretty good target on the ridge in front…a nice dense firing line formation. An overhead shot shows the attempt by the right flank Egyptian forces to move through the escarpment and scout out their flank. Moving up to oppose them can be seen an Ethiopian unit of warriors (bottom left). Trying to hold their position, the Egyptians on the ridge suffer losses from the enemy breechloaders – they are forced back off the ridge after taking losses. One unit presses forward to issue fire in an attempt to drive off the Ethiopians in the grass but they are proving hard to hit, particularly as the effects of the solar eclipse are still in play. A show down ensues. The second (and last) Ethiopian unit has moved into position behind the ridge to position itself to attack if the Egyptians attempt to move forward and scout. A view from behind the Egyptian position. One unit holds the water-well whilst the right flank is emerging from the escarpment with Pasha Rivertski…the end of the third turn (and likely game end next turn) draws near. The beginning of the fourth turn. It is clear now that the Egyptians cannot achieve their primary objective ie scout out the table sectors and exit the field. They have failed to finish the last turn in each of the respective sectors. At the bottom of the picture can be seen a lone figure – it’s the Bazinger hero, Bin Charlie. Even though his Bazingers have run away he did manage to, on his own, scout out the left flank position. However, at the end of the last turn on an event card draw, Bin Charlie was forced to seek cover away from the enemy, thus taking him away from the sector at turn’s end…damn! On the right flank the sector is scouted by the unit holding the Escarpment, but because of the impassable rocky kopje and the adjacent tall grass the unit is boxed in and must retire by the same way it came on ie up the escarpment path via the track. It is highly unlikely that the unit can make it off table. So there is now very little chance the main objective of the Egyptians can be achieved. Throwing caution to the wind, Pasha Rivertski through himself at the enemy in what can only be described as the act of a disgraced officer falling on his sword for his failed mission. The nearby Ethiopian unit could not restrain itself. Launching at the brave leader he fought hard, fighting off all four attackers! Though beaten, but not defeated, the Ethiopians once more attacked in a scene reminiscent of Gordon at Khartoum…same outfit too! With all hope lost, the Ethiopians held their ground now having seen off the Egyptians at the water-well and prevented the enemy from conducting its scouting mission…the pass and water-well have been held! This game was a lot of fun. 30 min setup and 2 and half hours of play. We hadn’t played any actions from this little known conflict but it actually has much to offer. The Egyptian army of Khedive Ismail has some interesting force mixes. it includes regular soldiers of second rate quality, dragoon heavy cavalry, a wide mix of support troops such as Sudanese soldiers, Bazingers, Bashi-Bazouks, archers, artillery and a camel corps….lots of interesting troops to play with. A lovely army to model. The troops also do excellent double-duty by forming the core force of a Zanzibari army, closer to the East African theatre, much liked by the folks here at agrabbagofgames. All the Egyptian figures are from the excellent Copplestone Miniatures range sold by Northstar with some Egyptian command figures from the Perry range – both work together just fine and look great on-table. The Ethiopian troops have been nicely pressed into service, this time representing the grand-fathers of the original use for them…all supplied by Empress Miniatures and include Aksari miniatures as well…they all blend together on-table very well. The Ethiopian-Egyptian conflict has many interesting elements to it and is a nice quirky non typical colonial conflict that includes some interesting characters. The khedive employed many a strange fellow from European adventurers to several American Civil War generals…bet you didn’t know that! The rules played flawlessly for this scenario, dishing up the usual interesting quirky moments with strange events popping up here and their such as the creation of the Bazinger hero, Bin Charlie and the wacky interposing of a solar eclipse …we’ve never had an eclipse in the game before and it had a subtle but, in the end, important effect…no planning for that one! 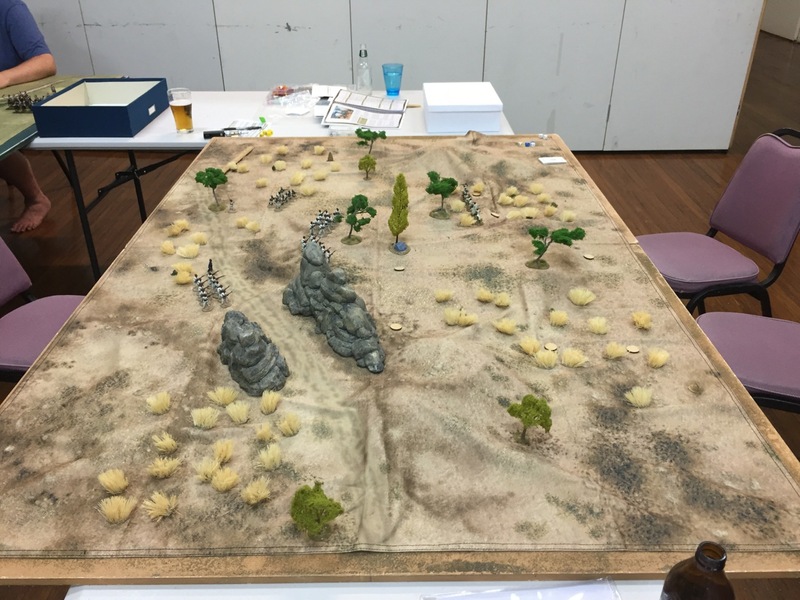 Fortunes swung back and forth and both players at various points felt they had victory in their grasp…the table looked great and forces of 40-60 figures was just right. 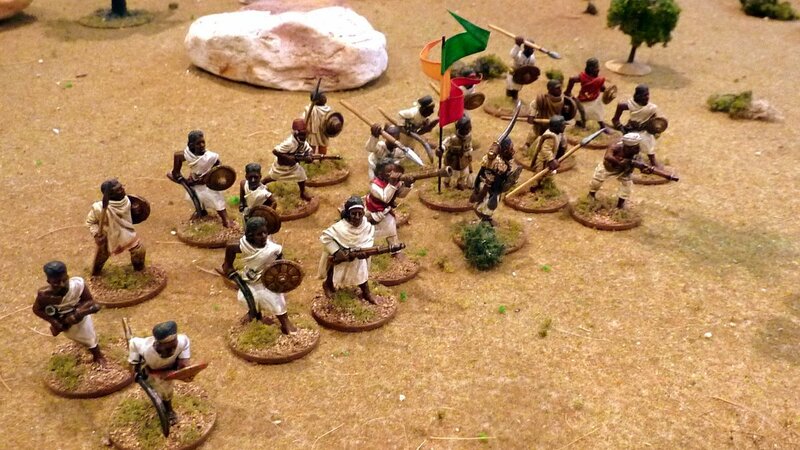 Regarding main objectives, the Ethiopians kept the Egyptians away from the water-well whilst failing to scout the six table sectors, so 4 points goes to the Ethiopians. The side plots however were interesting, these being worth 2 points each. The Ethiopian side plot, the Madness of Ras Ali, simply required that he survive the game to achieve his sideplot. In hindsight, instead of getting mad Ras Ali to tell the tall grass shooters to fall back two times in the game, the Egyptian player probably should have marched Ali in the open and then shot him down…but who was to know!…so 2 points to the Ethiopians for mad Ras Ali surviving..
On the other hand, as it turned out, Pasha Rivertski had a death wish! For him to achieve his sideplot he had to perish at the hands of the enemy which he successfully cajoled them into doing when he advanced defiantly in front of the Ethiopian spearmen…the Ethiopian player had no idea this was what was at play and in a rush of blood skewered the Russian emigre officer when he presented the opportunity…a wily Ethiopian would have spotted something was up and passed on the opportunity…next time! So 2 points for the Egyptians. So, with a 4 point split the Ethiopian player pulled a tactical victory from this encounter…a win for the homeland defenders…true to historical form…but I fear those Egyptians will be back! 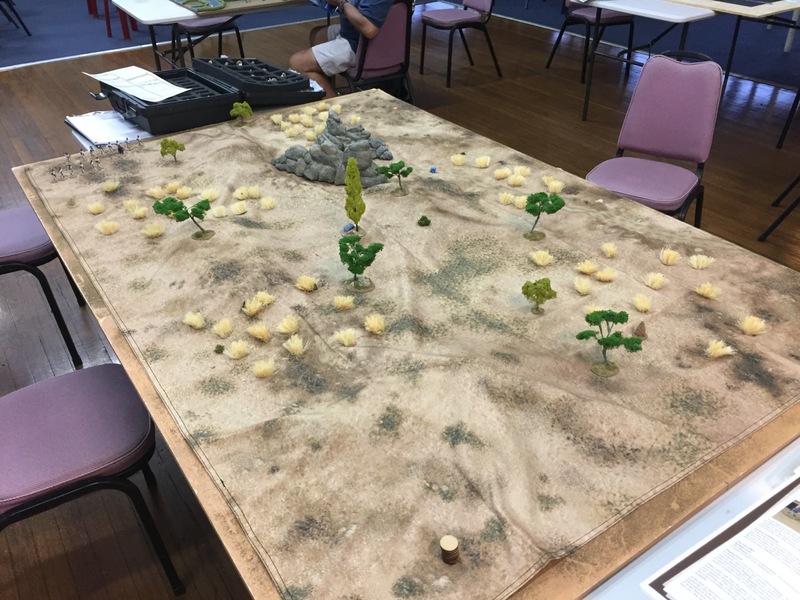 What of the terrain mat? I think the pictures speak for themselves. 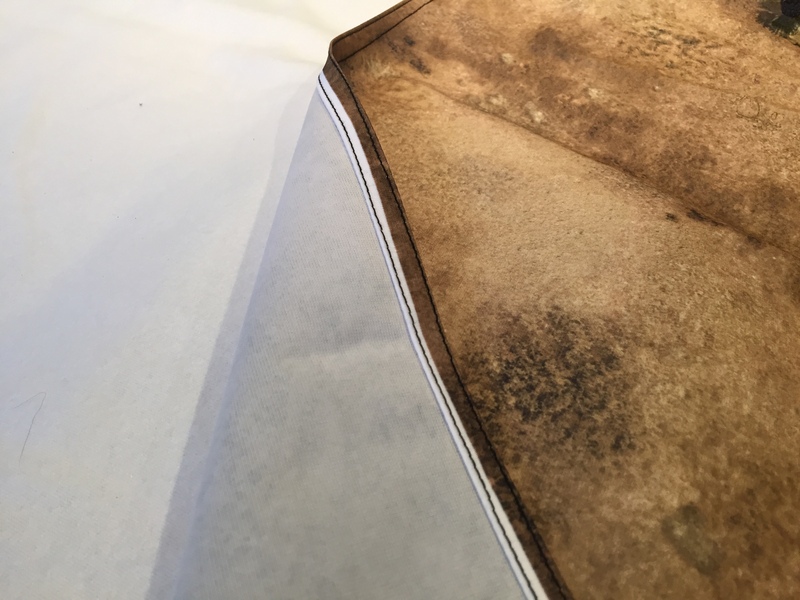 It is the best terrain mat print surface I have yet seen. The pictures above make the mat out to be a bit more dusty than the mat is..it has more of a yellow-ish hue to it. It is perfectly suited to Africa and the Mediterranean coast…it looks excellent and the lay on textured terrain pieces work very well with it. Highly recommended. Here’s a non game shot of the mat I took the following day.